Sitting on a harbour, there are plenty of Seafood Restaurants in Wellington. Fresh from the water, you're guaranteed satisfying plates of tuna, oysters and snapper. Head to the Waterfront, or one of the upmarket hotels, for the best choice. 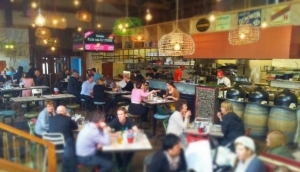 Wellington Seafood Restaurants enjoy a roaring trade. Most people will head to the Waterfront, especially along Queen's Wharf. Here, you can see catches coming ashore, and straight into the restaurant kitchens, so you know the freshness is guaranteed. Around Te Papa, you'll also find some very decent seafood places. Alternatively, head east to Oriental Bay, where you can enjoy luscious platters, with beach and harbour views, away from the hustle and bustle of the city. The CBD, amazingly, has very little in the way of seafood restaurants. Even Cuba Street and Courtenay Place struggle, so stay by the Waterfront. Another option is to head over the harbour to Petone, where you'll be able to enjoy great seafood on the jetty, with an amazing view of Wellington in the distance.